Undefeated European Jr. Middleweight champion Sergio Garcia successfully retained his championship with a convincing twelve round unanimous decision over previously undefeated former British Jr. Middleweight champion Ted Cheeseman on Saturday night at the O2 Arena in London, England. For twelve rounds Garcia and Cheeseman engaged in near non-stop combat with little or no let up for the entire duration of the bout. Despite the high pace which the fight was fought at, Garcia’s consistent offensive rhythm and cleaner punches were the story of this fight as he generally got the better of the action throughout and outworked Cheeseman throughout the bout. After twelve rounds Garcia retained his championship with a unanimous decision. Official scores were: 119-109, (On two scorecards) and 115-114 all for Garcia. Sergio Garcia advances to 29-0, with 13 Knockouts. Ted Cheeseman falls to 15-1, with 9 Knockouts. In a bout for the vacant Commonwealth Middleweight championship undefeated prospect Felix Cash scored a first round knockout over Rasheed Abolaji. Cash dropped Abolaji with a jab early in the round. Although Abolaji was able to beat the count, Cash would drop him again with a flush right hand. As he had done after the first knockdown, Abolaji was able to get up, but on unsteady legs the fight was stopped by Referee Marcus McDonnell. Official time of the stoppage was: 2:45 of round one. Felix Cash advances to 11-0, with 7 Knockouts. Rasheed Abolaji falls to 11-5-1, with 6 Knockouts. In the Cruiserweight division, undefeated prospect Lawrence Okolie scored a third round stoppage of Tamas Lodi. 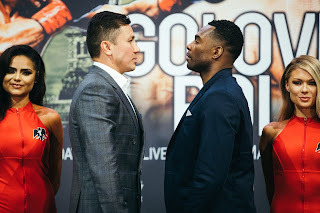 Lodi, who had taken the fight on short notice was dropped in each of the three rounds for a total of four knockdowns before the fight was stopped by Referee Howard Foster at 1:13 of the third round. Lawrence Okolie advances to 11-0, with 8 Knockouts. Tamas Lodi falls to 20-12-2, with 17 Knockouts. In a bout for the WBA Continental Light-Heavyweight championship, Craig Richards scored a third round knockout of Jake Ball. Richards was able to frequently counter Ball’s offense and scored knockdowns with his right hand. Ball did not seem to have much punch resistance and the one-sided encounter was halted stopped at 2:27 of round three after Ball had been knocked down in all three rounds. Craig Richards advances to 14-1, with 8 Knockouts. Jake Ball falls to 12-2, with 9 Knockouts. Also in the Light-Heavyweight division, undefeated Dana Zaxo scored a four round unanimous decision over Tayer Mehmed. Dana Zaxo advances to 4-0, with 2 Knockouts. Tayer Mehmed falls to 7-34-3, with 1 Knockout. In the Heavyweight division, undefeated Fabio Wardley scored a first round knockout over Morgan Dessaux. Official time of the stoppage was 1:43 of round one. Fabio Wardley advances to 6-0, with 5 Knockouts. Morgan Dessaux falls to 5-5, with 5 Knockouts. In the Super-Middleweight division, undefeated John Docherty scored a first round knockout of Przemyslaw Binienda. John Docherty advances to 3-0, with 3 Knockouts. Przemyslaw Binienda falls to 2-23, with 2 Knockouts. Rounding out the card, in the Middleweight division undefeated Scott Fitzgerald scored a second round knockout of Radoslav Mitev. Scott Fitzgerald advances to 12-0, with 9 Knockouts. Radoslav Mitev falls to 12-46-2, with 4 Knockouts. All and all, this card provided a look at some of the rising stars on the British and European Boxing scene. For Sergio Garcia, an unbeaten European champion who was largely unknown to many particularly here in the United States prior to his fight with rising British prospect Ted Cheeseman, his victory over Cheeseman should open up an opportunity to move into the world rankings in the 154lb. Jr. Middleweight division. In contrast to the twenty-nine fight veteran Garcia, Cheeseman will now go back to the drawing board and look to rebound from the first loss of his career. Although Cheeseman did not come out of this fight as the winner, it should not be overlooked that he put in a determined effort and was very “Game” in defeat in what was an extremely grueling battel. It will be how Cheeseman performs moving forward as to whether or not his loss to Sergio Garcia is a small bump in the road in the career of a potential world champion.